Grand Bois Hetre Extra Leger. Shaved. Tubeless. Thanks to Peter Weigle! According to his note on the inside of the tire, the front went from 370 to 313 grams. The rear tires, on which Peter left a trace of tread, lost about 40 grams. First 1000 miles on these will be on the new English 650B. Next thousand will be on the Herse (probably with tubes though). Knees are recovering and I should be back in business shortly. If my knee wasn’t injured, I’d be in the middle of George Swain’s Catskills Climbfest right now instead of sitting in front of my computer, working. And PS: Can anyone make my grass grow? Believe it or not, it was exactly 50 degrees colder today than it was on Tuesday. 92 degrees to 42 degrees in 4 days, plus 30-40 mph winds. 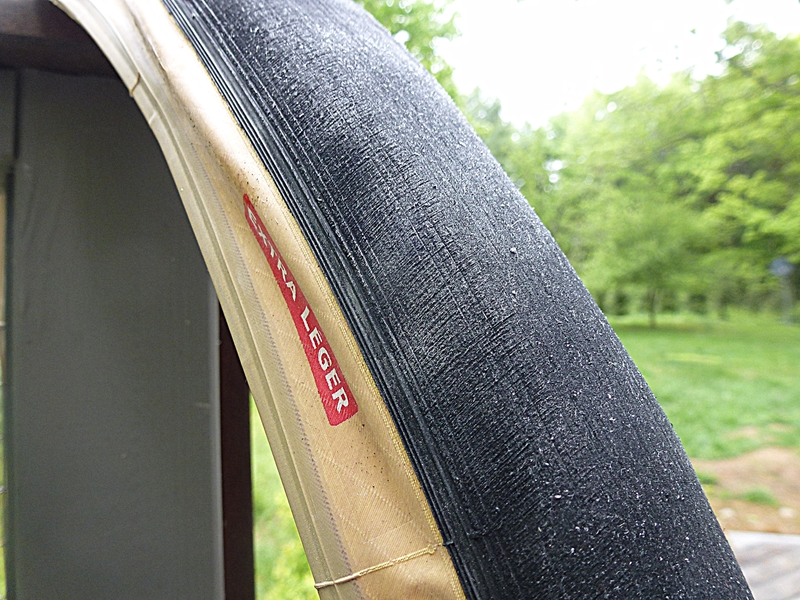 This entry was posted in 650B, tires and tagged Grand Bois Tubeless Hetre on May 25, 2013 by John Ferguson.